Samsung Galaxy Tab 10.1 inch review. The latest tablet PC released by Korean electronics giant Samsung. The Korean electronics giant Samsung released their tablet PC, the Galaxy Tab 10.1" recently. Like many other comparable tablets, this device runs the popular Android Honeycomb operating system, has full access to the Android Market, and fully supports Adobe Flash. The device is nicely built, attractive and loaded with features. At 1.25 pounds of weight, 0.34 in thickness, and at roughly $500 USD, this device is hitting all the right notes. The video resolution is solid on this tablet. Customers can switch between landscape and portrait orientations depending on the application, and big-screen needs can be easily handled by connection to your television. On the audio front, the speakers are acceptable, and audio quality with good headphones is outstanding. In some cases, there have been slight delays when using the onscreen keyboard. The device has the option to change from the Samsung keyboard to the Android keyboard, and users find that this solves the issue neatly. Additionally, this tablet has the option to use Swype, a software package that dramatically speeds up typing on smaller keyboards. The screen size of the Galaxy Tab makes Swype easy to use. Battery life is very good on this machine. Even with very heavy internet usage, 10 hours of battery life is on hand. Finally, if you have an Android-based mobile phone, then the choice to buy an Android-based tablet is much easier. Most Android phones are easily tethered to the Galaxy Tab. Linking phone and tablet is a great strategy, particularly when you need to increase your wifi availability. The best selling points for the Galaxy Tab are aesthetic concerns. The design is slim and stylish. The light weight makes it very pocket-friendly. The open-source operating system and accessibility to Android Market will win additional customers to Samsung. But as with any tablet, there are some disadvantages that you should be aware of. First and foremost is the concern shared by all tablet makers using Android. How will the OS hold up? Current issues are being addressed by updates, some available now, and some still on the way. Outside of the OS questions, the Galaxy Tab 10.1" is hampered by the lack of USB ports and SD card slots, so storage is limited. Email is restricted to Gmail only; multiple email accounts from different providers are not supported. Music file compatibility is limited as well, so check on this before you buy. Review of Barnes&Noble Nook Color, a crossbreed between a tablet pc and dedicated e-book reader. 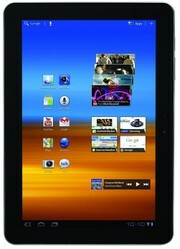 For a smaller, well-designed, and lightweight tablet, the Galaxy Tab10.1 inch tablet PC is a great choice. However, the lack of expansion slots on the machine is a major concern. Issues with the OS are likely to be solved soon.